Your download should start automatically, if you have any problems then Click Here to retry. 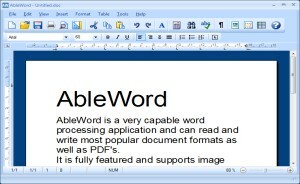 AbleWord is a very capable PDF Editor and word processing application that can read and write most popular document formats including PDF's. It is fully featured, supporting image formatting, tables, headers & footers and includes spell checking and print preview functions. Best of all it is totally free even for commercial use.